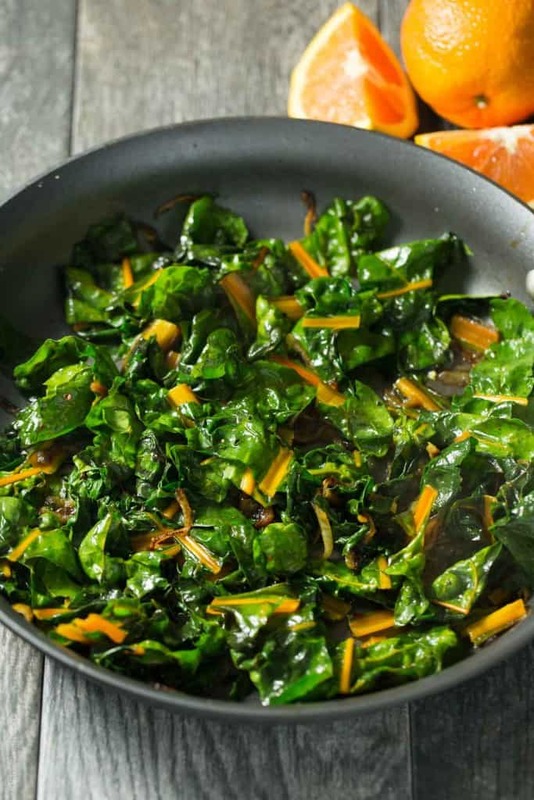 Orange braised rainbow chard with sweet caramelized onions. A delicious and healthy side dish that is vegan, gluten free, paleo and Whole30. I had every intention to do a winter garden this year. But being very pregnant, and then having the baby early, the garden has been untouched since late summer. Our dead tomato plants are bare in their trellice. The mustard weeds have taken over. Our garden is basically a vegetable graveyard. Which is why I was so excited to notice some rainbow chard and swiss chard growing in one of our planter boxes in January. It was a garden miracle! I planted both of them on a whim in the spring, which was a major rookie gardener mistake because they are winter crops. They stayed itty bitty all summer long, but started sprouting up all on their own. Such a fun surprise. A great sign that we have been getting plenty of rain this winter, because Shawn certainly hasn’t watered the garden in over 6 months. I used the swiss chard in this bacon and white bean stew, and have been waiting for the perfect time to cook up the rainbow chard. And that perfect time came this weekend, when I decided to cook us some pork chops (recipe coming Friday!) and forgot to buy some greens at the grocery store. Rainbow chard straight from our garden it is! When it comes from your garden, it automatically tastes way better than anything you can buy at the store. I love rainbow chard. If you’ve never had it, it tastes kind of like a stronger, heftier spinach combined with smooth and watery aspects of cabbage when you cook it down. It doesn’t get quite as wilty as spinach, which is why I like it even more. 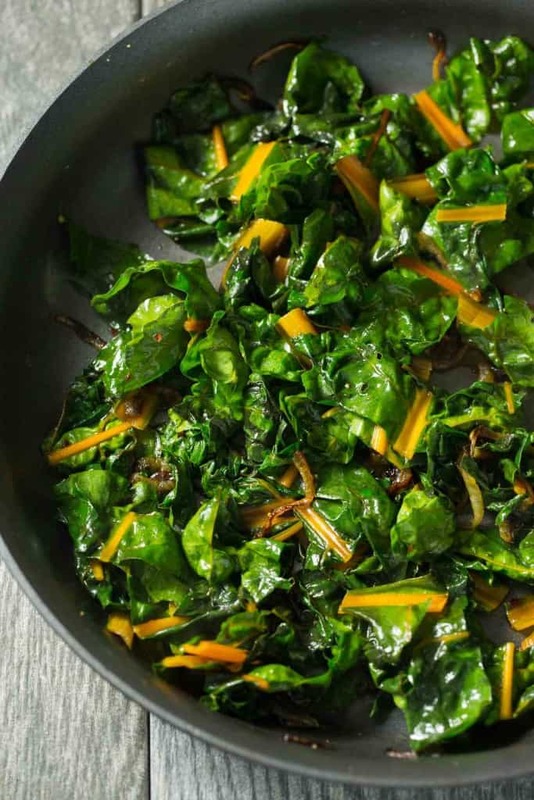 This orange braised rainbow chard starts with thinly sliced caramelized onions. This gives it a sweet note to compliment the earthy rainbow chard. 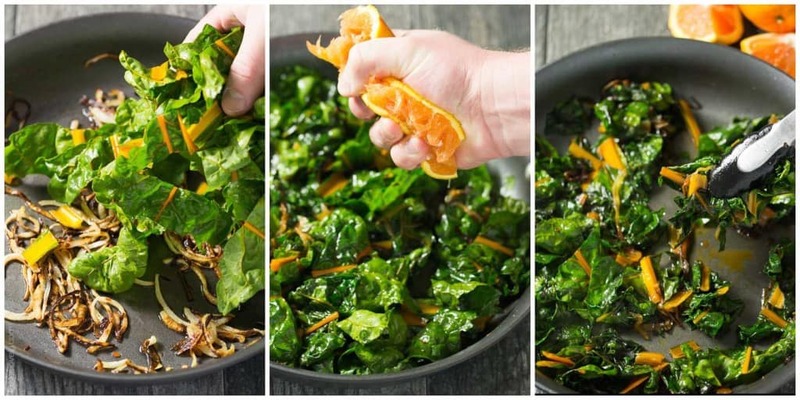 Then you add in the rainbow chard and cook it until it is just wilted, then finish it with the juice from half an orange. 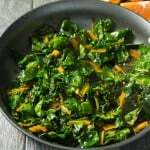 The sweet acid from the orange makes this the perfect greens side dish that is as healthy and wholesome as can be. Vegan, gluten free, paleo, and Whole30. Heat a large sautee pan over medium heat. Add the olive oil, onion, salt, pepper and red pepper flakes. Slowly caramelize the onions, about 10-15 minutes stirring occasionally. When the onions are golden brown and caramelized, add the rainbow chard. Toss with the onions. Cook until the chard just begins to soften, about 2-4 minutes. Add the juice from the orange. Toss, and cook another 2 minutes. Taste for salt and pepper. Serve warm. Foods do taste so much better when you grow them yourself! This chard is so pretty, Natalie! I love that you’ve added caramelized onions and orange! What a nice surprise to find this chard growing in your garden! I love chard, but have never cooked with it before. I love the orange flavor and onions in here. Sounds delish! It was the BEST surprise. I was joking with Shawn that if I had “tried” to grow it, it probably wouldn’t have grown as well. Haha! Thanks Gayle! So, I am jealous that in CA you have such thing as a WINTER garden. Lol. Here we are buried under snow and have such a short growing season in the summer! I am itching to get a garden started for this year but we just got another layer of snow! This is one gorgeous side dish Natalie! I don’t know how you do the snow. I like the snow for the weekend when I’m skiing, but I can’t imagine living in it full time. Hats off to you! Ahhh the beauty of a garden; it continues to give even if unattended to… such a sweet gift. 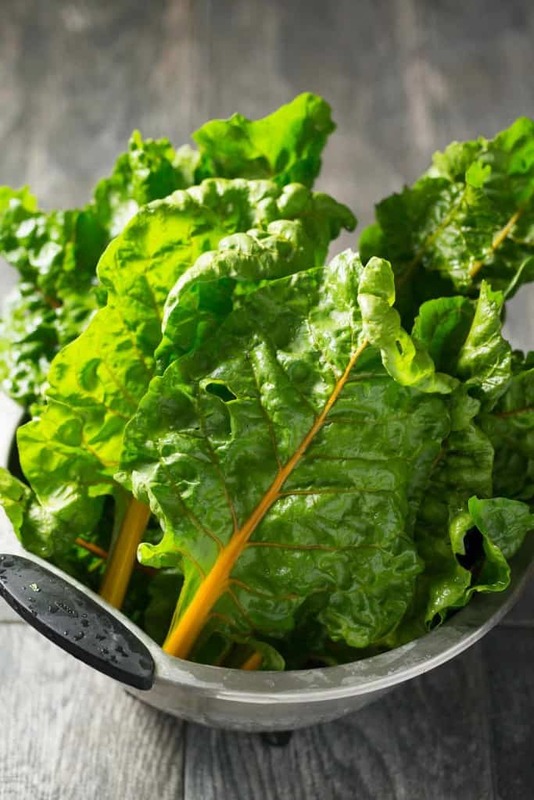 One of my favorite veggies is chard. Being able to go pull it straight from your garden is like a little piece of heaven. I put chard in green smoothies all summer long. It’s taste is mild enough and is incredibly nutritious. Your addition of orange juice is sooo delicious! I can’t wait to give it a go! Thank you for this Natalie! Was the best surprise! And got me really excited for my summer garden. You’re the best Traci! Isn’t? Best surprise from our garden. Thanks Kelly!